When we were in Houston for All-Star Weekend, one of the marquee events was the annual Technology Summit at the Houstonian, featuring celebrities such as Mark Cuban, David Stern, George Bodenheimer, Magic Johnson, Charles Barkley and Anderson Cooper. Little was made of another gathering: The first-annual Atrocious GM Summit, held Sunday morning at the La Quinta Inn. 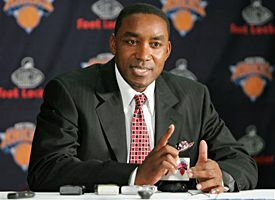 Our dream panel included Philadelphia’s Billy King; former Raptors GM Rob Babcock; Lakers GM Mitch Kupchak; former Knicks GM Scott Layden; former Cavs GM Jim Paxson; Minnesota’s Kevin McHale; former Orlando GM John Weisbrod; and, of course, Isiah Thomas of the New York Knicks. Sadly, Wes Unseld was unable to make it after he accidentally traded his first-class Delta Airlines ticket to Houston for three Southwest Airlines tickets to Atlanta. Simmons: Guys, first of all, thanks for joining us today, it’s an absolute honor to be here. King: Just remember, if you do a good job for the next two hours, I’ll give you a $25 million contract for six years! Simmons: Jim Paxson, let’s start with you. Last February, you traded a 2007 first-round pick to Boston for Jiri Welsch. Four months later, after you were fired by the Cavs, they traded Welsch to Milwaukee for a 2006 second round pick. To my knowledge, that’s never happened before. Walk us through that. really, why would I care about protecting future No. 1 picks if I was probably getting canned? McHale: Hear hear! I don’t think we have a first-round pick until 2017. And I might trade that one this week. Paxson: See, Kevin knows what I’m talking about here. The second element: Are you rolling the dice with someone with “potential,” who has never contributed to a winning team? Jiri had bounced around the league and couldn’t even crack Doc Rivers’ regular rotation — and Doc uses 11 guys a night. So that was in place. Third, and most important, are your fans going to be outraged when they hear about the trade and say things like, “What the hell?” and “How can we stop this guy, he’s a menace?” That was there, too. And that’s what made the trade so appealing. It’s not often you can trade for someone who’s worth half as much four months later. Along those same lines, we aren’t just trying to upset our fans, we’re trying to confuse them. For instance, three years ago, I gave Kevin Ollie $15 million over five years. Now, he’s a below-average guard with no real skills — if you rated a point guard in eight different categories, he’s probably a C-minus or below in each of them. If you’re a Cavs fan, how are you supposed to react to that contract? Complete confusion, right? Well, those are good reactions. At least your fans are discussing the team. If the fans are talking about you, it doesn’t matter if it’s good or bad, at least they’re talking. Layden: And there’s another element here, Jim: You want the fans to feel like they could do a better job than you. When I was in New York, every Knicks fan thought they could do better than me. Every one of them. And they were probably right. Well, you know what that really means? There’s a small piece inside of them that says, “If this schmuck can run the Knicks, maybe some day, I can run the Knicks.” And once they think that, you have them for life. Those are the people who keep buying tickets and jerseys and hats. Simmons: Mitch, when you took over the Lakers, you had the best two players in the league and could have won 10 straight titles with the right moves. Instead, you couldn’t get it done. 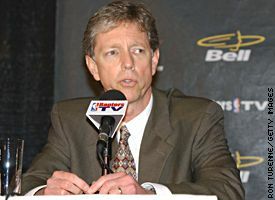 Then you traded Shaq for 30 cents on the dollar; you gave cap-killing contracts to run-of-the-mill guys like Chris Mihm and Devean George; you blew all of your draft picks; you wasted the next three to four years of Kobe’s prime by drafting a high school center over someone like Danny Granger, who could have helped right away; and then, you outdid yourself by trading Caron Butler and Chucky Atkins’ useful expiring contract for Kwame Brown. But the Shaq-Kobe saga overshadowed everything; you haven’t gotten enough credit for being a complete debacle. Does that bother you? still, nothing. 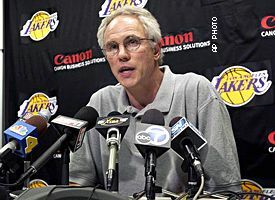 Then Phil [Jackson] goes on the record and calls Kwame a “p—-.” Nothing. People in Los Angeles just don’t care. When you look at what I’ve done in L.A., it’s amazing, really. I traded the best center in the history of basketball 19 months ago, and all we have to show for it is an unhappy Lamar Odom, Kwame and Brian Grant’s eight-figure buyout. And yet, nobody mentions me. No offense, Isiah, but you don’t realize how lucky you are — when you screw up, everyone goes crazy. I built a team in which Smush Parker is our third-best player and the 10th-best guy on the Clippers would play 40 minutes a night for us — yet does anyone ever talk about me? Of course not. It pisses me off. Thomas: And that’s one of the reasons I wanted to work for the Knicks. When I screwed up in Toronto, nobody cared. When I ran the CBA into the ground, nobody cared. When I coached the Pacers and lost a series to Boston in which we had 10 of the best 12 players, nobody cared. In New York, they care. Right now, I’m working on a trade with Orlando where we give up Penny Hardaway’s expiring deal and Trevor Ariza for Steve Francis. It’s an illogical trade in every respect — Francis’ contract is terrible, there’s no way he’ll mesh with the other guys, he’s never won anything, he gives us the same problems that Marbury gives us, it’s a disaster right out of the gate. And that’s what makes it so great. When we pull this trade off, New York fans might actually riot. I’m not kidding. Kupchak: Sure, Isiah, rub it in. Thanks to all of those moves, the Knicks have more untradable contracts than everyone else in the league combined; they won’t be under the cap until 2009; they have a payroll that’s $50 million higher than anyone else; and they won’t have a high lottery pick until 2008 because of the Curry trade. So how can you sell this as a rebuilding effort when you don’t have any picks, and how can you sell this as a move to contend when none of the current guys could possibly mesh? like right now, I’m making it seem like KG is a possibility for us, and that’s why I’m gathering all of these assets. But I don’t have a chance in hell of getting KG. If Minnesota trades KG, it’s going to be for cap space, picks and young players, and we can’t give them two of those three things. So they would never deal with us —. McHale: I wouldn’t be so sure about that! McHale: Have you seen some of the moves I have made? Name another GM who cost his team three first-round picks because he wanted to sign someone like Joe Smith to a max contract under the table! 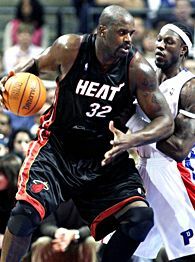 Name me another GM who would have willingly traded for Mark Blount, or given huge contracts to Marko Jaric and Troy Hudson, or signed sketchy character guys like Michael Olowokandi and Eddie Griffin! You don’t think I would give KG away in a terrible trade? You’re crazy! I resent that! Isiah: I didn’t mean to offend you-. Simmons: Kevin, let’s talk about the Joe Smith debacle. What delighted me wasn’t how you lost the picks, but that you were ready to give a max contract to the likes of Joe Smith. Does it hurt your feelings that nobody remembers how dumb this was? and you never hear this mentioned. If we were a big-market team? Different story. Babcock: I have to disagree with that — I think everyone can agree that I made the worst trade of the past 10 years. Simmons: The Vince Carter trade? Babcock: Right. I gave him away to the Nets. Gave him away. And I’m known for that now — it didn’t matter that I was working for Toronto. So you can have a negative impact on a small-market team, I think. Simmons: Let’s talk about that trade, Rob. Walk us through your thought process. Babcock: When you’re trading an unhappy superstar, like Isiah said before, you have to get one of three things back: Cap space, draft picks or young stars. Or else your fans will flip out. Especially if the guy immediately starts playing hard again, which was a mortal lock in Vince’s case, because he was clearly tanking it for us. Anyway, my goal was to trade Vince without getting cap space, draft picks or another young star — that’s what would have made it the worst trade of all-time. The problem was that you can’t be too obvious with this stuff or the commissioner’s office will veto the deal. So what ended up happening was, the Nets gave us two non-lottery picks to save face, but everything else worked out — not only did we not get a superstar back, we took on three bad contracts, including Alonzo Mourning’s deal, which we had to buy out. So instead of getting cap space back, the trade hurt our cap space. I was more proud of that than anything. Weisbrod: You know, I loved that trade, but I loved the Rafael Araujo pick even more. Babcock: Well, you hope with these things, but you never sure how they’ll work out until they happen. Simmons: Let’s talk about the draft, guys. What are some strategies there? Worst guy available? Taking someone at a position where you already have someone? King: See, that’s where you’re wrong. It’s always better to make good picks in the draft — this way, your fans can become attached to them, then you can trade them for inferior guys with bad contracts. Plus, it throws the media off your scent a little bit. I would much rather draft a decent guy, then trade him down the road, or overpay him with a crazy contract that makes no sense or kills my cap space. If you’re openly tanking draft picks, it’s too obvious. you want to stockpile as many assets as possible, only because it gives you more options to do something dumb. Babcock: I couldn’t agree more. That’s the single-biggest mistake I made with the Araujo pick. In retrospect, I should have taken Igoudala, kept him for a year, then traded him last summer for Joel Przybilla and immediately given him an $85 million contract extension. Oh, well. You live and you learn. I wish someone had told me this before I drafted Ndudi Ebi and William Avery! Simmons: So if you don’t want to kill your team with bad drafting, what other recourses are there besides trades? Thomas: Keep changing the roster — you don’t want any semblance of continuity. Once guys get used to playing with one another, they might start winning. Look at the teams that have done well over the last 25 years — it’s always been the teams that built around a nucleus. I even played for one in Detroit. That’s why I like to keep mixing things up every six to seven weeks. Why chance it? King: I’m also a big fan of giving out absurd contracts that tie up your cap space, for three reasons. First, it drives the fans crazy and gets them talking about the team. Second, your fans won’t complain that you aren’t making any big moves, simply because you can’t make any big moves, your lack of cap space prohibits you from getting quality guys unless they have baggage. And third, when people look back and try to put your reign in some sort of historical context, those salary numbers will jump out even more. Just look at what I’ve done in Philly: Since we made the 2001 Finals, I gave Mutombo a $68 million extension even though he could have been, like, 48 years old for all we knew. I gave $35.5 million to Aaron McKie. I gave $29 million to Eric Snow. I gave $18 million to Greg Buckner. I gave $40 million to Kenny Thomas and $25 million to Brian Skinner. I gave $25 million to Kyle Korver and $60 million to Sam Dalembert last summer. That’s $300 million of contracts to guys who were either on the decline or never that good in the first place. Plus, I traded for other bad contracts, guys like Keith Van Horn, Glenn Robinson, Kevin Ollie, you name it. And then, last February, the pinnacle — dumping three bad contracts for C-Webb, who everyone thought couldn’t be traded because of his contract and because he ran with a limp. Now we have an aging team built around two past-their-prime stars and our cap space is killed through 2008. And we completely wasted Iverson’s prime, when he was one of the best players of his generation. King: Thank you. Thank you very much. Kupchak: That was like the “Perfect Storm,” really. You had a very good GM trading with a very bad GM. You had a superstar willing to shame the game of basketball and taint his entire career just to get traded. You had a small market team playing in relative obscurity, in a docile city where the fans really wouldn’t revolt beyond a certain degree. I don’t think we’ll see that again. Paxson: I agree. In just about every case, if there’s an expensive name available on the market, there are strings attached. If there weren’t strings attached, why would their team be so anxious to trade them? Fundamentally, it makes no sense. For instance, if I offered you a 2003 Jaguar convertible with 12,000 miles on it for $5,000, then claimed nothing was wrong with the car, would you be a little suspicious? Or would you convince yourself that the car just needed a change of scenery? I don’t know why the fans haven’t figured this out yet — name players are usually available for a reason. Thomas: That’s why, as I said before, I like to float out rumors that we’re “arming ourselves with assets” to make a run at guys we could never realistically get — like KG, Kobe or LeBron — because it gives our fans hope. They think we have a chance at those guys, when the teams that actually have a chance are the Bulls, Clippers, Hornets, Bobcats, Celtics or anyone else with valuable young players and multiple picks. You really think I could get KG this summer for Jalen’s contract, Channing Frye, David Lee and a 2012 No. 1 pick? Come on. McHale: You’re doing it again, it’s like you’re deliberately testing me. would that be an unprotected pick? Simmons: Guys, guys, wait until after the summit. you can always disguise a terrible trade by blaming either the luxury tax or a lack of cap space as your reason, like when the Celtics ended up getting stuck with Vin Baker a few years ago, even though he was practically bringing a flask onto the court with him for the layup lines. But if you have an unhappy superstar, you’re better off trying to mend fences with him over dealing him, that’s the one thing fans won’t forgive. Simmons: You learned that the hard way with the Tracy McGrady trade, right? Weisbrod: I sure did. That ended up being your classic three quarters for a dollar trade — we got Francis, Mobley and Cato for him, or as I liked to call it, “the pu pu platter.” For the purposes of destroying a team, it worked fine. But I underestimated how much Orlando fans liked Tracy — they were just furious with me, I ended up getting death threats and everything. Weisbrod: Yeah, apparently that was a first for the league. Weisbrod: But I went too far — you don’t want to end up losing your job because of one trade, and that’s what happened to me. I have a lot of regrets about the whole thing. I had six or seven more horrible moves in me. Simmons: What about acquiring guys with personal problems who could potentially screw up your team chemistry? How important is that? McHale: Oh, it’s huge, there’s no question. Look at my team right now — it’s like a crazier, more dysfunctional version of the team from “The Fish That Saved Pittsburgh.” Crazy is good. Crazy players can throw off the fans because they can say, “Wow, on paper, we look fantastic, the only question is chemistry.” But that’s the thing — a good NBA team is 50 percent talent and 50 percent chemistry: Look at Phoenix right now, they’re getting it done with two All-Stars and parts that nobody else wanted. How? Chemistry, that’s how. On the flip side, if you don’t have good chemistry, you’re going to lose. Look at my Ricky Davis trade — we’re 4-9 with him, and in 12 of those 13 games, he took more shots than KG. Eventually, they’re going to fight to the death. You think I didn’t know this when I traded for him? Thomas: I’m with Kevin — you can never have enough problem guys. When Vin Baker was bought out by Boston because of his drinking problems, we jumped on him. When Qyntel Woods bounced around because he used to fight pit bulls, we jumped on him. I’m even thinking about having Chris Andersen move in with me — I want to make sure I’m the first one there when his suspension ends. Simmons: Scott Layden, you were really a pioneer of sorts in terms of screwing up cap space and taking on terrible contracts. Simmons: You traded for cap-killers like Glen Rice, Luc Longley, Travis Knight, Shandon Anderson and Howard Eisley. You gave Allan Houston $100 million when he couldn’t have gotten more than $71 million anywhere else. You gave Charlie Ward $28 million. You traded Marcus Camby and a lottery pick that could have been Amare Stoudamire for Antonio McDyess and his bum knee. By the time you got canned, they were a lottery team. Looking back, did you go overboard? Were you too incompetent? ” All the hope had been beaten out of them. To me, that’s the beauty of what Isiah has been able to pull off. Casual hoops fans can look at the Knicks’ roster and say, “Wow, we have Marbury, Eddy Curry and Jalen Rose? !” Diehard fans can look at the roster and say, “This is just crazy enough that it might work,” or “Maybe we can package some of these guys for a superstar.” So there’s a little bit of hope there, even if it’s misguided, ridiculous and inane. When I was there? No hope whatsoever. And that was my biggest mistake. Simmons: So you like what Isiah has done? Layden: Hell, yeah. Take the Francis trade, if it happens: Logically, it makes no sense because Francis and Marbury are the same player — expensive, shoot-first point guards with huge entourages and attitude problems who have never won anything. Even if you’re getting Francis for nothing, it still makes no sense on paper. For example, let’s say you spent $3,000 on a living room sofa two years ago that you didn’t really like. To make the sofa stand out a little less, you bought a leather chair for $2,200 that doesn’t match –. Simmons: Marbury is the sofa and Jamal Crawford is the chair in this case? Layden: Precisely. And the room still looks bad. So now, you’re on Craigslist and you see that someone is selling another $3,000 sofa for $900 that’s almost exactly like the sofa you have. And there’s no way you would ever want two big, ugly sofas in the same room. It would just look ridiculous. But your mind-set is, “Hey, how can I turn down a $3,000 sofa for $900?” So you buy the sofa and stick it in the room, which is now cluttered with stuff since you also spent another $10,000 on some crummy art, a coffee table with support problems, two giant bookcases that have to be turned sideways, some wobbly end tables and a smashed sculpture that was patched back together with duct tape. But since it’s too late to go back, you spend another $5,000 on an interior decorator to make the room work. Well, you know what would happen? He wouldn’t be able to make it work. You bought too much crap. See, this is why Isiah is a genius: He’s assembling the basketball version of that nightmare living room, and he has the fans convinced that either the expensive interior decorator — in this case, Larry Brown — will be able to make everything work, or he can somehow swap some of that furniture to one of his neighbors for a first-class piece of art. And he’s spending an ungodly amount of money! And you never hear rumors that he might get fired! I think it’s a tribute to him and his staff. He’s the best-ever at being an atrocious GM. He really is. Thomas: Thank you, Scott, that means a lot. Simmons: Lemme ask you, Isiah — the one red flag seems to be that you’re spending an alarming amount of money. Just this year alone, you have a $123 million payroll for 15 wins. When the luxury tax kicks in, you will have shelled out nearly $200 million for a 25-win team. Doesn’t fiscal responsibility matter here? thanks for your time! Ladies and gentlemen, the most atrocious GMs of the decade! Simmons: Guys, what do you say we cap this off with a high-stakes poker game back in my hotel room, just the nine of us? Seriously, what do you say?